NBA playoffs bracket pools are becoming increasingly popular. While they will never rival the popularity of “March Madness,” NBA playoff pools provide basketball lovers with another way to follow the action. Setting up and running a pool is easy with a free printable NBA playoffs bracket sheet. These sheets are simple to use and make it so you won’t miss any of the postseason action! Note: The information published on this page is for entertainment purposes only. The National Basketball Association (NBA) was originally known as the BAA until the league merged with the NBL in 1949. In the first season of the BAA playoffs in 1947, a three-stage, six-team tournament took place. The Philadelphia Warriors outlasted the Chicago Stags in a seven-game series to win the title. The playoff format changed several times and teams were added and taken away during the 50’s, 60’s, 70’s and 80’s. The current playoff system in the NBA was put in place in 2006. A total of eight teams from each conferenc e claim a spot in the postseason. The conference tournaments consist of three best-of-seven rounds. The winner of each conference championship series earns a spot in the NBA Finals. The championship series is also a best-of-seven set, and the winner earns the right to hoist the Larry O’Brien trophy at the conclusion of the series. 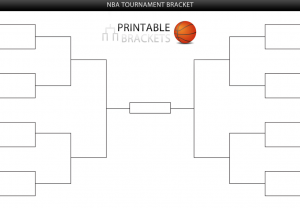 An NBA playoffs bracket pool or contest can be set up much like a March Madness pool. There are clearly far fewer teams in the field, but a weighted system can still be used to award more points for correct picks in later rounds. The NBA playoffs and NCAA men’s college basketball tournament are difficult to compare, but the professional postseason can definitely be more enjoyable by starting an NBA playoffs bracket contest or pool in the home or office.